Note: Just activation code, No Physical box, No CD/USB. It can be using to Activate and Update your copy of Project Professional 2016 online! This is a 100% genuine license for lifetime activation of Microsoft Project Professional 2016. Licensed for 1 PC. 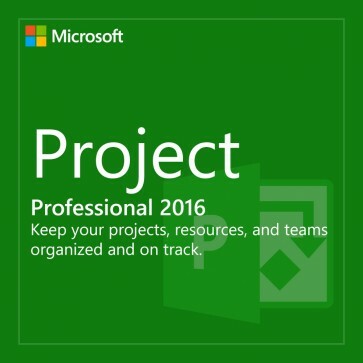 Use the new Project 2016 to organize and keep track of your projects. Profit from flexible features, which make it easy to get started and to work efficiently and productively. Create sound reports about project progress and forward project details efficiently to your team and anyone else involved in the project. Project 2016 includes all the features of Project Standard 2016 plus collaboration tools, resource management, SharePoint task sync, submit timesheets and more. Project 2016 significantly improves Resource Management and Resource Capacity Planning. Supporting these key capabilities are enhancements such as new Resource Engagements, a brand new experience for resource managers, and Capacity heat maps. Download the latest version of Microsoft Project 2016 Professional, USB installer is not applicable. Graphics: Graphics Card acceleration requires a DirectX 10 or later.